The prototype was called 'Kate' after the last few letters in 'syndicate' and with the lessons learnt from her construction 'Merlin' was built - the first of the new Class. The Class Association was formed in 1947, the first of its kind, which has been used as a pattern by many other classes. The rules were devised to allow for the development of hull and rig rather than be of a 'one-design' nature. Dilly, circa 1949. photo Beken Cowes. 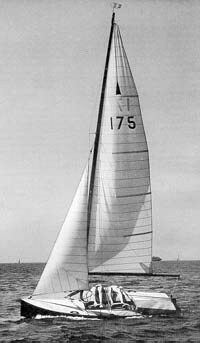 The 'Rocket' class was formed in 1949 when a group of Tynemouth sailors commissioned Wyche & Coppock of Nottingham to design a half deck 14ft., dinghy. This boat had more sail area, narrower decks and was lighter. After much debate the Classes merged in April, 1951 to form the 'Merlin Rocket Class'. Wyche & Coppock introduced glued plywood construction in 1953 which replaced the solid planked, ash ribbed, nailed clinker hulls which up until then were the only means of construction. Terylene sails were adopted in 1959 replacing cotton sails, at the same time aluminium masts were being experimented with which produced a far more powerful rig. This coupled with the development of transom flaps lead to the development of wider and wider hulls - flaring out to over well over 7ft 6ins. to increase sitting out power. In 1969 a maximum beam of 7ft 2ins. was introduced to allow the boats to be towed and not break the maximum width rules!! 4ft-7ins Sealgh and 6ft-8ins Krakawot. The next most significant development was the spinnaker chute which allowed the spinnaker to be raised and lowered very much more easily than the conventional launching 'out of the bag'. 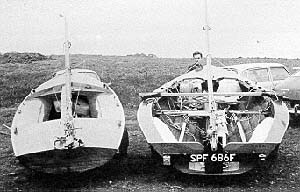 In 1972 an experimental four plank boat was built with the objective of reducing costs however it was not well received by the Class and was not pursued. In 1980, following research, foam sandwich hulls were allowed linked with a change in the construction rules to lower the front buoyancy tank and improve the structural bulkheads around the shrouds. The development of materials and designs has resulted in light strong and durable hulls..
Merlins in build at Rowsell Bros. Spud inspects a new GRP hull. A feature of the Class has been the high standard of craftsmanship and finish that the various builders have maintained over the years. 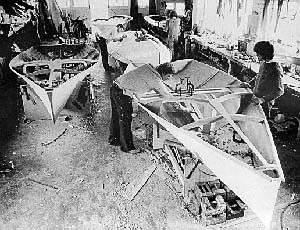 To give an idea of how designs have changed the class, in 1966 the championships were won by a Proctor Mark IX with a beam of 5ft., whereas two years later the winning boat was a 6ft. 8in., wide 'Wotnot' design. A number of prominent designers have associations with the Class e.g. Phil Morrison, Ian Proctor, David Thomas, Keith Callaghan, Ian Holt and so on. Whilst the Morrison designs dominated the seventies and eighties, the nineties have been dominated by the Holt designed 'Canterbury Tales' - or derivatives thereof. The spinnaker size and pole length was increased in 1979 and in 1996 the pole length was increased to 2300mm to allow spinnakers to be made to their maximum size within the existing rules. Carbon fibre is being used more frequently in the construction of mast, boom and spinnaker poles. Class Championships have been held on the sea every year since 1946, with over 15 venues used over the years. Traditionally the Championship was sailed over a week with six races sailed and five to count. In 1999 the same six race series is to be sailed over a long weekend at Weymouth in August. The Silver Tiller Series was devised in 1950 and sought to find the helmsman who could win consistently sailing on a whole range of waters. To that end the series runs over a whole season with competitors having to count their best five results having sailed on restricted water, open water and the sea. Consequently competitors get to sail on rivers, lakes, reservoirs, estuaries and the sea. Additional to this national event there are 'local' circuits such as the Midland Circuit and the recently established 'Thames Circuit'. As the nineties draw to a close the Class and its builders are examining ways to maintain the character of the class yet at the same time take advantage of new materials and techniques.